The amount of contact lens wearers is growing at a very rapid pace. The technology in contact lenses has improved dramatically over the last few years and thus the huge increase in contact lens wearers. Many people are falsely missled into thinking the contact lens is going to adequately protect the eyes from the harmful suns rays. 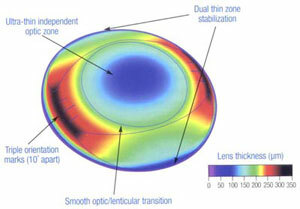 Many contact lens companies are incorparating UV filters into the contact lens matrix. There are many different hydropolymer materials used in contact lenses and each has a different UV blocking property. Some block more than others. However the contact lens does not block any of the harmful rays from damaging the lids and the delicate area around the eyes. Contact lenses are not a good filter for the HIV rays (high intensity visible spectrum) like many sunglasses are. So invest in your vision and purchase a good pair of name brand sunglasses that will block 99-100% of the UV light. When you purchase contact lenses at www.expresscontacts.com you can get a free pair of sunglasses with your order and also get a 20% discount code to use at www.expresssunglasses.com when purchasing any name brand sunglass. This is some of the added value you get when shopping at these two internet contact lens and sunglass companies. Express Contacts and Express Sunglasses have been offering incredible deals and great customer service for over ten years. Express Contacts and Express Sunglasses are involved in research and clinical studies in the latest in contact lens and sunglass technology. Express Sunglasses has a large lab where they customize sunglass lenses to the customers specifications and are constantly researching ways of improving visual performance and protection for the customer/patient. Express Contacts is affiliated with a large contact lens clinic downstairs from the corparate office. So this is also a reason to put your trust in www.expresscontacts.com and www.expresssunglasses.com for all of your contact lens and sunglass needs. These are professionals that are actively involved in all aspects of contact lens and sunglass technologies. If you are wearing some of the most advanced contact lenses like the Ciba Focus Night and Day, Ciba Focus Dailies, Bausch and Lomb Purevision, Acuvue Oasys or Cooper Visions Biomedics XC you need to also be wearing a good pair or name brand sunglasses like Costa Del Mar, Oakley, Rayban, Revo or Bolle. Sunglasses today are a fashion statement, improve visual performance and act as protective eye wear from the sun and the elements. Take advantage of the free sunglass offer at Express Contacts when you purchase your contacts. Also Utilize the 20% off code you get at check out when purchasing your contacts to be used at www.expresssunglasses.com on any name brand sunglasses. Sunglasses are a must to be worn over your contacts if you really want the best for your vision and eye health. Sunglasses should be worn at all ages starting as early as infancy! Exposure to the ultraviolet rays of the sun can and will damage the eyes. Many eye diseases like cataracts and macular degeneration may be linked to sun exposure. Skin cancers around the eye and other growths like pterygiums may be linked to sun exposure. The huge benefits of wearing the proper sunglasses over your contacts justifies spending the extra money on a good pair. If you are searching for that right pair of sunglasses go to www.expresssunglasses.com and look at the vast variety of sunglasses available. www.expresssunglasses.com offers great customer service, free shipping and a free pair of sunglasses from selected group with each purchase. Remember contact lenses by themselves arent adequate protection from the sun. Invest in the future of your vision with a good pair of sunglasses.